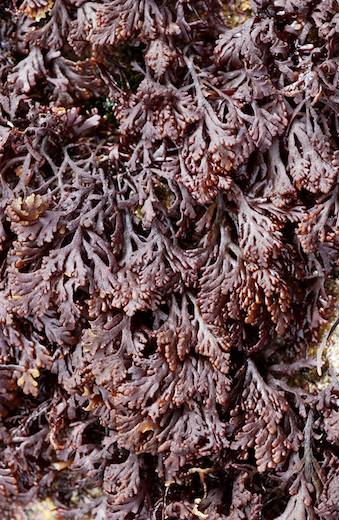 Common names: Pepper Dulse; Míobhán (Irish). 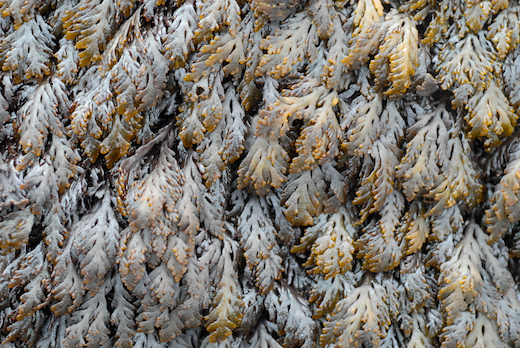 Description: Cartilaginous, usually markedly compressed, blackish-purple bleaching to pale yellow fronds, usually 20-80 mm long, forming extensive, closely interwoven turfs from entangled stolonous holfasts. Very variable in size and form. Main axis usually simple, branching alternate distichous, repeatedly pinnate. Ultimate ramuli short, blunt. 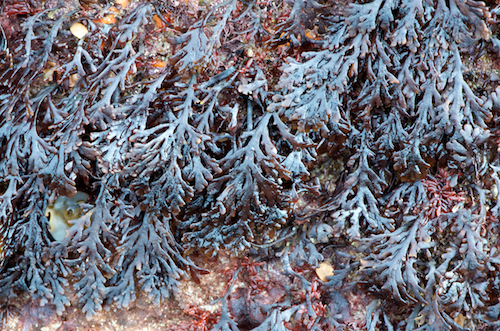 Habitat: On rocks, perennial, throughout intertidal, often as flattened rosettes covering exposed rocks, also subtidal, generally distributed, abundant. Similar species: Osmundea osmunda is very similar but arises from a discoid holdfast, and is generally lower down on the shore and larger, with isolated plants. Osmundea truncata is much less common, is more pinnately branched, generally grows epiphytically, and rapidly degenerates on collection. Key characteristics: Stoloniferous holdfast, smaller than Osmundea osmunda , and less profically branched. Site © M.D. Guiry 2000 - 2019. Important copyright notice: all text, design and photographs on this site are copyrighted by M.D. Guiry unless otherwise stated and all rights are strictly reserved. Click here for copyright information and contact. Website design: 249 Design Studio. Site maintained by M.D. Guiry (michael.guiry@nuigalway.ie). There have been 8736873 page loads since 1 January 2014 on 25 April 2019.